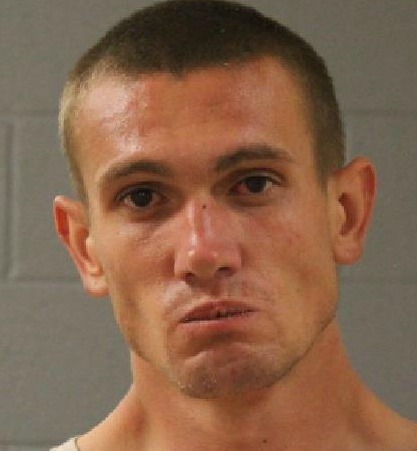 St. George Police arrest man allegedly seen leaving retail store through shattered glass door at 3 a.m.
ST. GEORGE — Authorities say a burglary was thwarted early Friday morning after police found a man crawling through a broken door at a St. George retail store. The suspect, 25-year-old Braedan A. Smith, of St. George, was arrested and booked into Purgatory Correctional Facility on one third-degree felony count of burglary for entering a building unlawfully, one class B misdemeanor offense for theft and one class A misdemeanor count of criminal mischief for intentionally damaging property. The misdemeanor theft charge was later enhanced to a third-degree felony when the initial charges were submitted to the Washington County Attorney’s Office for review. At the time of the incident, officers were dispatched to a burglary alarm activation shortly after 3 a.m. at the Ross Dress for Less store located at 365 S. River Road in St. George. The retailer’s corporate security department contacted the St. George 911 Communications Center and told dispatchers that the suspect was caught on video surveillance and was still inside of the store allegedly placing items in a bag. At that point, responding officers were advised that it was a business burglary in progress, St. George Police Officer Tiffany Atkin said. Police arrived at the scene within two minutes of the call and reportedly found one of the store’s glass entrance doors shattered. Within minutes, Atkin said, Smith was seen exiting the store still carrying the items and was confronted by officers positioned directly in front of the store. “They were waiting for him when he exited the store and called out to him as soon as he crawled through the door,” Atkin said, adding that Smith was then quickly taken into custody. Approximately $150 in merchandise was recovered by the officers, Atkin said, explaining that the criminal mischief offense was added to address the $500 in damage to the entrance door. Detectives were later called in to conduct an investigation and process the scene for evidence. Friday’s arrest is one of several for Smith in recent months, including a prior burglary arrest in early March. In that incident, court records say Smith was chased out of a residential garage by a homeowner who told police he saw Smith “rummaging through the vehicle parked in the garage.” Police located and arrested Smith a short time later during a search of the area. He pleaded guilty in that case to one third-degree felony charge of burglary of a dwelling. Smith has been arrested for several misdemeanor offenses as well, most recently on Dec. 5 for allegedly failing to disclose his identity to an officer during a stop. In prior arrests, he was charged with a misdemeanor count of possession of paraphernalia in September and a misdemeanor count of interfering with an arresting officer in August. Smith was also arrested in Iron County in July 2017 for shoplifting that resulted in a misdemeanor theft charge, of which he later pleaded guilty. This report is based on statements from police and may not contain the full scope of findings. Persons arrested or charged are presumed innocent until found guilty in a court of law or as otherwise decided by a trier-of-fact. His life doesn’t sound like a bundle of joy. Having a job would make it easier–actual income and a place to live.